Blessed Thistle Herb is native to the Mediterranean. It can be found growing in the Eastern United States and all through out Europe and is widely known for its medicinal qualities. Traditionally Blessed Thistle leaves and flower tops were used to enhance the appetite and ease digestive related problems. Blessed Thistle leaves are rather leathery and hairy and blooms with yellow flower tops, both the leaves and the flower is used for several medicinal applications. Teas made of Blessed Thistle have been drunk before meals through out history to stimulate appetite and aid in digestion. It is also known as Blessed Tea. Blessed Thistle tea is often consumed before a meal to aid in digestion and to avoid flatulence. Historically Blessed Thistle would be grown by monks to cure Small Pox. Blessed Thistle can be used to regulate menstruation by bringing it on as well as aiding in heavy flow. Blessed Thistle tea can be used alone or with other herbs to aid in lactation for breastfeeding women.The most common herb to enhance breast milk production is fenugreek and milk thistle. The combination of fenugreek and milkthistle tea has been used to help with breastmilk flow and production for 100’s of years. Blessed Tea can be prepared by steeping 1 – 2 teaspoons of dried Blessed Thistle leaves and flowers in 8 ounces of boiling water for 10 minutes. Blessed Thistle can be combined with other herbs as well. Blessed Thistle should not be used by women who are pregnant as it could cause miscarriage or other complications. Large doses of Blessed Thistle could cause vomiting and or diarrhea. The prickley Hawthorne bush is native to Europe, Africa and western Asia and is often used as a hedge in Europe though it grows to be about 13 feet high. In North American climates the hawthorne tree grows to about 5 feet tall. The Hawthorne plant has a grayish colored bark and thorns that grow along the branches. The leaves are shiny and dark green with a bluish tint to the undersides. Hawthorne trees produce white flowers and bright red berries that hang in clusters. Hawthorne berries are widely used for heart problems and its medicinal value for blood and heart related illness is thought to be both effective and safer than other drugs with similar qualities. Hawthorne is used for irregular heart beat, to lessen the plaque build up in arteries and increase blood flow and oxygen in the blood to the heart and brain. It is known as a high blood pressure regulator. In addition to the benefits to the heart and circulatory system Hawthorne has been used to rid the body of excess water and salts and support weight loss programs. Medicinal properties extend to digestive disorders, insomnia and even sore throats can be relieved by Hawthorne. Effect of the benefits from Hawthorne herbals are seen after several weeks use as it is a slow acting herb. Hawthorn is available as a dried herb, tea and as a tincture which is more potent than the tea. It is sometimes found under the name Indian Hawthorne. It is thought that the thorns of the Hawthorne tree were used to make the crown of thorns worn by Jesus at his crucifixion. Hawthorne tea is prepared by steeping 1 – 2 teaspoons dried leaf and flower or 2 – 3 teaspoons of the dried crushed berry in 8 ounces of boiling water for 15 – 20 minutes. Hawthorne extract can also be added to other herbal teas for additional effects. Hawthorne herb is often used to quiet muscle spasms and as a sedative of the nervous system without inducing sleep. A compress of Hawthorne berries have been used to help remove splinters and embedded foreign bodies in the skin. Hawthorne is thought to be an effective treatment in heart disease and will help to improve blood supply to the heart and smooth the heart contractions. The leaf bud of the Hawthorne can be cooked and eaten, the leaf can be chewed to nourish and relieve hunger, the berries can be used to make jellies and fruit sauces and the flowers can be added to salads. Hawthorne is considered a safe herb; however, caution should be made in excessive use of it. Found growing in damp meadows, ditches and pond or river banks, Meadowsweet is a perennial herb common to Europe, Eastern US and Canada. Meadowsweet has creeping roots, long and thin reddish stems and produces white five peddled flowers with protruding stamens. In the late 1800’s a component of the Meadowsweet plant was used to create an ingredient in the drug Aspirin that is still used today. Along with Vervain and Water Mint, Meadowsweet was considered sacred to the ancient Druids. The herb is aromatic and the flower scent is not the same as the scent of the leaves which give a more almond aroma. A tea can be prepared from Meadowsweet by steeping 1 ounce dried herb in 1 pint of boiling water for 10 minutes. Meadowsweet can be used to ease symptoms associated with colds and flu including respiratory problems, aches and fever. Meadowsweet has been effective in treating acid indigestion and peptic ulcers. Meadowsweet works well in combination with other herbs to treat arthritis pain and inflammation. Caution should be used when given to children as it, like Aspirin can possibly lead to Reye’s syndrome. Those who have allergies to aspirin should not use Meadowsweet. Decaffeinated Tea Is Easy To Make! Making your own decaffeinated tea consists of nothing more than water and tea. It can’t be simpler! If you are worried about getting too much caffeine, or if you can only have it in small amounts for medical purposes, make sure you read this page. 1) Start making your tea like you normally would. 2) Boil some water, let the water cool (depending on what type of tea), and pour the water over the leaves to let them infuse. You shouldn’t use much water because your going to be pouring it out anyway. Instead of infusing the leaves for a few minutes, only let them infuse for about 30-45 seconds, and pour off the lightly infused water. 3) Finally, put the leaves back in the pot and pour the water over them like you normally would. Let them infuse for the regular amount of time that they should infuse depending on the tea. Since most of the caffeine comes out of the tea within the first 30-45 seconds, you now have tea that has about 80% less than it normally had. You’ve just made your own homemade decaffeinated tea! If you’re interested in making your tea decaffeinated, I highly recommend you do it the way I just explained. If you buy a decaffeinated tea from a producer, make sure you know how they make that tea decaf. There are 2 methods they take for making a tea decaf. 1) The first method uses the solvent ethyl acetate to pull the caffeine out of the tea. Although effective, it also takes out about 60% of the polyphenols (antioxidants). You want all the antioxidants you can get! 2) The second is a natural method using water and carbon dioxide. This is the preferred method of decaffeinating tea. This method is called effervescence. I highly suggest that you call the manufacturer of the tea and find out which method they use. If they do the first method, please find another supplier which uses the natural water method. Russian Tea Cakes are one of my favorite tea time cookies. They just melt in your mouth and are perfect with a cup of tea! These cookies are also known as Russian Tea Balls – the shape of course! and Russian Tea Cookies. They are simple to make and just delicious! At christmas, the Russian Tea Balls are referred to as ‘Snowball’ Cookies! The can be shaped, but traditionally they are rolled into a ball. Try not to handle the dough to much or you will get a ‘tough’ cookie. Little handling allows for a light, flaky cookie that melts in your mouth. Here are some free recipes for you to try for your next tea party, Christmas, or any event. Preheat oven to 325 degrees. Cream the butter adding icing sugar gradually until light and fluffy. Stir in flour, vanilla. Roll into 1-inch balls and place on an ungreased baking sheet or parchment paper. Bake for 12 to 14 minutes or until just turning golden, do not overcook. Remove from oven and while still warm, roll in confectioners’ sugar. Sometimes I omit the nuts from the recipe, and the cookies are still excellent. This is the same recipe that you will find if you are looking for Russian Tea Balls or Russian Tea Cookies. The Russian Samovar is used to serve Russian Tea. It is also used in Russian Tea Ceremonies and is a beautiful item. Today, many people collect Samovars and they add grace to any tea party table. There is some dispute to the creation of the Samovar. Some say it originated from Russia, and others say it was created in China. Regardless, it is embedded in Russian culture. The first Samovars date back to the late 18th century and were made from metal in the City of Tula, South of Russia. The reason for metal, is a portion of the samovar was filled with coal to keep the water and tea hot. By the 1950’s electric Samovars were being introduced. The traditional Samovar had three compartments within it. Samovars were traditionally a large metal container with a spout at the bottom and a metal pipe running vertically through the middle of the container. The pipe was filled with coal to heat the water. A third compartment or unit went atop filled with strong concentrated tea that was also kept warm. Tea is served from the Samovar by taking 1 part concentrate and diluting it with about 10 parts of water from the spout. 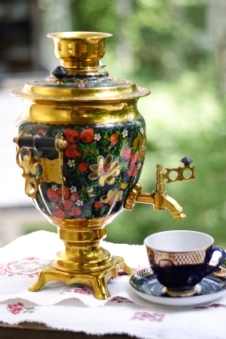 The Samovar is the most well known symbol of the Russian Tea Ceremony. The entire ceremony centered around the Samovar and its ability to ‘serve tea’ to large numbers of people. The Russian expression “to have a sit by samovar” means to have a talk while drinking tea. Many pool owners put a lot of effort into maintaining their swimming pool, but they often forget about the deck. The deck begins to age and the allure of your pool starts to fade away. It even gets worse if you believe that the only solution to this problem is replacing your deck. However, there is an easier way to restore and rejuvenate your deck: applying pool deck paint. The process of painting your pool deck is much simpler than painting a pool, possibly even shorter that the time it would take a robotic pool cleaner for small pools to clean your pool. When buying your deck paint, you need to go for a product that will protect the surface from different elements. Concrete has some special needs due to its moisture issues, characteristics porosity, and alkalinity. Also, an improperly painted deck with the wrong paint wouldn’t stand against the harmful UV rays from the sun, foot traffic, and even the scraping from your pool’s furniture. Your best bet is to get a paint that is designed for swimming pool decks as opposed to getting a general purpose or all-purpose paint. Your pool deck will look attractive in colors that show the natural outdoor environment. Shades of gray portray natural stone and slate, shades of tan hint at sandy beaches, shades of dusky blue and green bring water in mind, shades of brown and maroon imply masonry and brick. Although you can simply paint your deck in a single color, the hues will add more appeal if they are combined effectively. For example, a deck that is dusky sea or gray could be complemented by an adobe-colored serpentine path or a brick-colored border that leads to your pool. First, choose the paint that will best suite your deck. Inspect for any crack on your deck. Clean them thoroughly using a wire brush. Also, ensure that you clean your deck. Leave the deck to dry; until it is completely dry. Get your roller, insert it in the paint, and roll it around your deck. You might require little brushes to paint corners and other tight spots. Prevent cracking – Precipitation and UV rays from the sun affect the deck and the structure begins to change, which might result in warping. Wear-resistance – A wear-resistance paint guarantees durability. Protect the deck from insects and microorganisms – Most decks, especially wooded ones, are a great environment for mold and fungus growth. They also attract insects. High-quality decorative nature – The paint should preserve the original look of your deck for years. Getting the best pool deck is a simple as following the above four factors. After that, you can easily paint your deck to ensure that you preserve it and offer it an attractive look. When installing an above ground pool for adults the most critical thing is to choose the ideal site in your garden for the pool and then preparing the site to support your swimming pool. You should also know what to put under above ground pool on grass before you begin the installation process. Avoid these mistakes when installing your above ground swimming pool in your yard. Using excess mason sand. The sand should be used as a buffer from the liner to the surface but not for leveling. Setting the pool’s track on the sand. You shouldn’t put the sand under the track; it should be inside. Not troweling or compacting the sand. First, compact the sand and then trowel it to have a smooth finish. If you know “what is the best above ground pool” and get it, you can easily install it directly on the grass (these pools are designed to rest on grass). But that isn’t recommended since you won’t get a flat, smooth, and slightly resilient or soft padding surface below your pool that can prevent abrasion and punctures to your pool. Therefore, use any of these materials to lay your pool on. This is a superb base for your swimming pool since it will provide a level and flat surface, which means that your pool won’t shift. But remember that concrete isn’t smooth and might abrade your pool over time. Therefore, you might need to add a layer of sand on top of the concrete. There are a lot of commercial products that are ideal for placing under your pool if you intend to install it in your garden. Most of these products fit all types and sizes of above ground swimming pool. A layer of sand over the grass is the old way of installing an above ground swimming pool in the garden. It is easy to use and inexpensive and can be combined with other installation methods – like laying sand first and then a commercial pad over it. Sand might not be the best to lay on the surface. Therefore, it is advisable to use solid urethane foam sheets, not upholstery foam. Solid foam won’t slide around the surface when you add water to your pool. Knowing how to level an above ground pool on grass is important but knowing what to put under above ground pool on grass is even critical. So, use any of the material we have listed above and remember not to make the mistakes that people do when installing their pools. Instant Russian Tea Recipes are quite easy to find and we have included two different Russian Tea Recipes for you to try. One of the recipes uses fruit juice as a base and the tea is ready to drink as a result, the second Russian Tea Recipe makes a dry mix that you can store in a dry container such as a jar, and make a cup of Tea at any time. It is an instant tea and makes a beautiful gift in a jar! Steep tea and spices in boiling water and remove. Add sugar. Mix juices and lemon concentrate in large pitcher. Add tea mixture. Dilute to taste. To prepare this Instant Tea, simply add 3 teaspoons of the dry mix to an 8oz cup of boiled water. Of course you can add more or lesss depending on your personal preference. From the ingredients, you can see this is a very ‘sweet’ tea. I hope you enjoy these Free Tea Recipes! Please share them with your friends and family. Cinnamon is a tree native to Sri Lanka and South India and the bark of the Cinnamon tree is used as a spice all over the world. The Cinnamon tree grows to be about 10 – 15 meters high and produces a small purple berry which contains a single seed. Cinnamon trees are cut down almost to the ground after growing about 2 years and several shoots will then grow up from the roots. The shoots are stripped of their bark and it is set out to dry for commercial use. There are two widely used variations of Cinnamon, Cassia and Ceylon; Cassia being the stronger of the two, however the Ceylon is considered to be the true Cinnamon. It is said that around 100 AD Pliny the Elder wrote that 350 grams of Cinnamon was equal in value to over 5 kilograms of silver which would make Cinnamon about 15 times greater in value by weight. Cinnamon can be a flavorful and useful component of any tea and can be produced by boiling a Cinnamon stick in 8 ounces of water for 10 minutes and that water used for steeping any tea. You can also add 1/8 of a teaspoon of dried powdered Cinnamon to 8 ounces of hot water or added to tea. Cinnamon is used world wide as a spice and used along with sugar to flavor cereals, deserts, breads and even beverages. Cinnamon is often used in herbal remedies as it will aid in the effectiveness of other herbs. Cinnamon has been used to treat diarrhea, colds, flu, arthritis and even yeast infections. Cinnamon oil can be used to deaden the nerve associated with tooth pain. Traditionally Cinnamon has been used to enhance personal spirituality, speed healing and increase passions. The over use of Cinnamon oil in toothpastes, gums and ingestion can lead to gum inflammation and sensitivity. High dosed of Cinnamon, generally with the internal use of the oil is cautioned during pregnancy and breastfeeding. Cinnamon can be an allergenic and can topically can cause skin irritation.